The Board of Control for Cricket in India (BCCI) selected its best 15-man Team India squad for the ICC Cricket World Cup 2019 on Monday. There have been few surprising inclusions and exclusions according to the fans and cricket pandits. The four names that attracted much buzz are Rishabh Pant, Dinesh Karthik, Vijay Shankar and Ambati Rayudu. While Rishabh and Ambati have been snubbed by the selectors, DK and Vijay will be flying to England and Wales. Post the big announcement, netizens expressed their disappointment, happiness and everything in between via funny memes and hilarious tweets online. Team India for ICC Cricket World Cup 2019: Twitterati Shocked With Vijay Shankar's Selection, Wanted Rishabh Pant in CWC19 Squad. 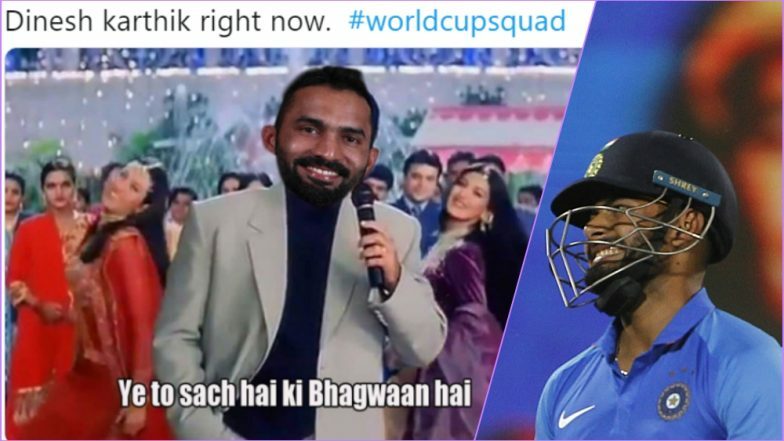 Dinesh Karthik beat Rishabh Pant in the race to become the second wicket-keeper in the Indian team for the upcoming World Cup in England and Wales. The five wise men of Indian cricket, led by MSK Prasad, met in Mumbai on Monday and picked the 15-member squad. Vijay Shankar goes to the showpiece event as the number four batsman and Ravindra Jadeja has been picked as the third spinner ahead of a fourth pacer. KL Rahul joins in as the back-up opener. Did ICC Raise a Question Over Ambati Rayudu’s Exclusion From Team India 15-Man Squad for CWC 2019? Announcing the 15-member India squad for the prestigious quadrennial event, Prasad said that Karthik's wicket-keeping skills and ability to handle pressure resulted in him being picked over Rishabh Pant. But he made it clear that wicketkeeper-batsman Dinesh Karthik will not automatically start in the playing XI in the upcoming World Cup and will only get a chance when MS Dhoni gets injured. Vijay Shankar has been included in the squad as the number four batsman instead of Ambati Rayadu while Ravindra Jadeja has been picked as the third spinner instead of a fourth pacer. Speaking over Shankar's inclusion, Prasad said that the 26-year-old all-rounder from Tamil Nadu gives "three dimensions" to the team. Despite all the explanations, Twitterati had a tough time digesting Pant’s exclusion and this is how they reacted.